The following AHS Chorus students participated in the Georgia All-State Reading Chorus in January. WANT TO BE A PART OF THE AHS CHORUS PROGRAM?? As we enter the Spring 2018 semester, it's now time to begin thinking about classes to take next year. If you are currently an 8th graders at WBMS or HMS - Sign up for "Intermediate Chorus I". If you are interested in auditioning for SWE or Chorale as a freshman, that audition window will open at the beginning of April. However, DO NOT WAIT TO SIGN UP FOR CHORUS AFTER AUDITIONS! Otherwise, you risk not getting placed in chorus at all. (Counselors are strict about class placements.) It's always easier to alter/delete than it is to add. If you are currently a 9th-11th grade student at AHS - Come see Mrs. Levesque about class options for next year. Your placement will depend on your prior experience in chorus and current music reading skills. Our commercial will air on the Morning Show very soon! **If you are already a member of our program and are interested in auditioning for an advanced/mastery-level ensemble, the audition window will open at the beginning of April. The following students have been accepted into the Georgia All-State Chorus! Any Alpharetta High School Chorus student auditioning for All-State Chorus on November 11th are invited to attend as many of the AS Help Session as possible! We will work on perfecting the solo, will practice through scales, and will drill sight singing to help our students feel as confident as possible in November. All help sessions are held after school from 3:45-5:00 PM in the chorus room. Students may come-and-go as needed for these informal sessions. Note that sessions are on different days depending on grade. 2018 Concert Tour in IRELAND! Attached, you will find information regarding our trip including pricing and an itinerary. (For those who attended our interest meeting last year, the information is almost identical.) We currently have four fundraisers scheduled for the fall semester, for those who are concerned about the price. We want to give students/families who want to attend every opportunity to make that possible. However, know that a $500/person deposit will be due in August before any fundraisers have occurred. If you are planning on attending this tour or have interest, PLEASE take a moment to fill out the short Google survey that was sent by e-mail on Thursday, May 18th. The results of this survey will help us to determine whether a Spring Break or Summer tour will work best for our students and their families. We hope that many of our students and their families will be able to join us for this once-in-a-lifetime trip! Placements for the 2017-2018 school year will be posted on the chorus room door after 1:00 PM on Friday, May 12th. Congratulations to the AHS Select Women's Ensemble (Class A/B) who received straight superiors in all categories at LGPE! They also received a superior in sight singing. Congratulations to SWE! Photo and audio of their performance coming soon! Congratulations to the AHS Chorale (Class A) who received straight superiors in all categories at LGPE! They also received a perfect score in sight singing. The students put on a spectacular performance. Audio of their performance coming soon! Dr. Pat freer hosted a master class with our chorale and swe ensembles. We are two weeks away from our Large Group Performance Evaluation! These two ensembles have been working very hard, and we look forward to their performance on March 3rd. We had the opportunity to invite Dr. Pat Freer from Georgia State University to come work with our ensembles. He provided some great feedback to both groups that we'll be able to use in making our LGPE performance even better. Shh!! It's secret valentine time! Our chorus program is about more than just making great music! We also love to host social events during the year to promote unity among our choir members. 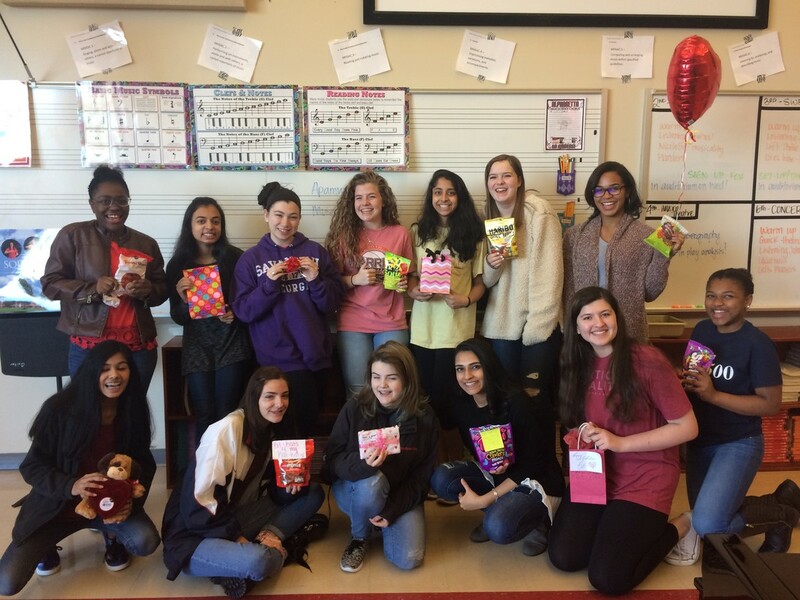 A February tradition is to host a Secret Valentine swap. Students who choose to participate will be given a secret valentine, and they will become someone else's SV. Throughout the week, they get various gifts from their valentine. They won't be revealed until the Secret Valentine Party. Stay tuned for pictures from our reveal party! 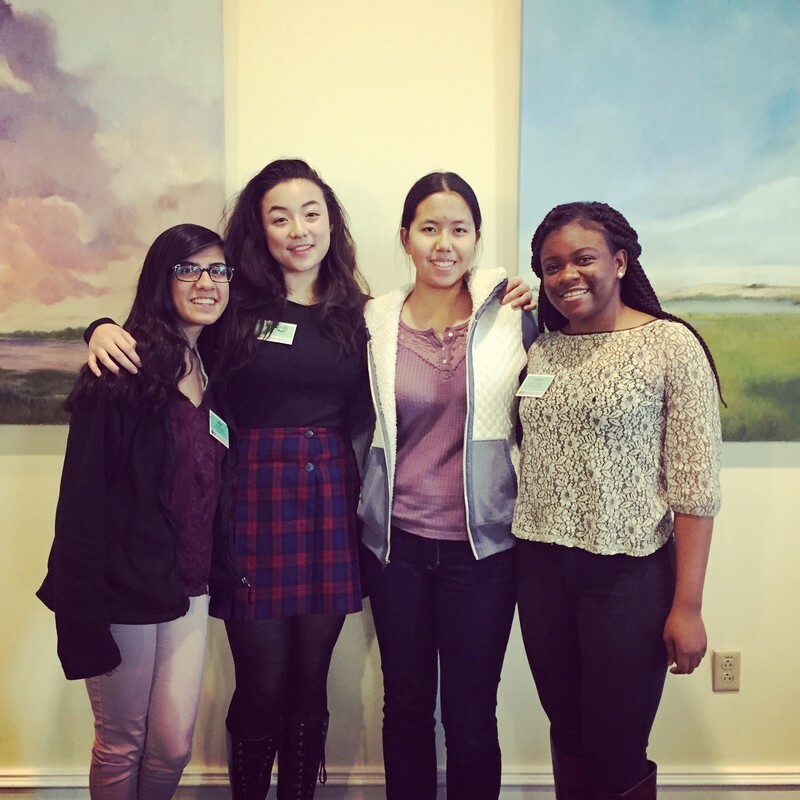 Congratulations to Isha Shrotriya (senior), Shaolynn Betts (senior), Julia Gu (junior) and Esther Omene (senior) for being selected to participate in the Georgia All-State Reading Chorus. These ladies represented Alpharetta HS well, and we are very proud of them! Calling all singers and beatboxers!! AUDITIONS FOR MOMENTUM AND HYPE WILL BE AUGUST 22ND AND 23RD WITH CALLBACKS ON THE 24TH. Students should prepare two contemporary songs, one upbeat and one ballad. (Two of contrasting styles). Students will sign up for a 5-minute audition slot on the 22nd or 23rd. A callback list will be posted, and all callback students are expected to attend on the 24th. Any student who does not attend callbacks will not be considered for either group. Final group lists will be posted on Friday the 25th. Sign-up for an audition slot on the chorus room door. 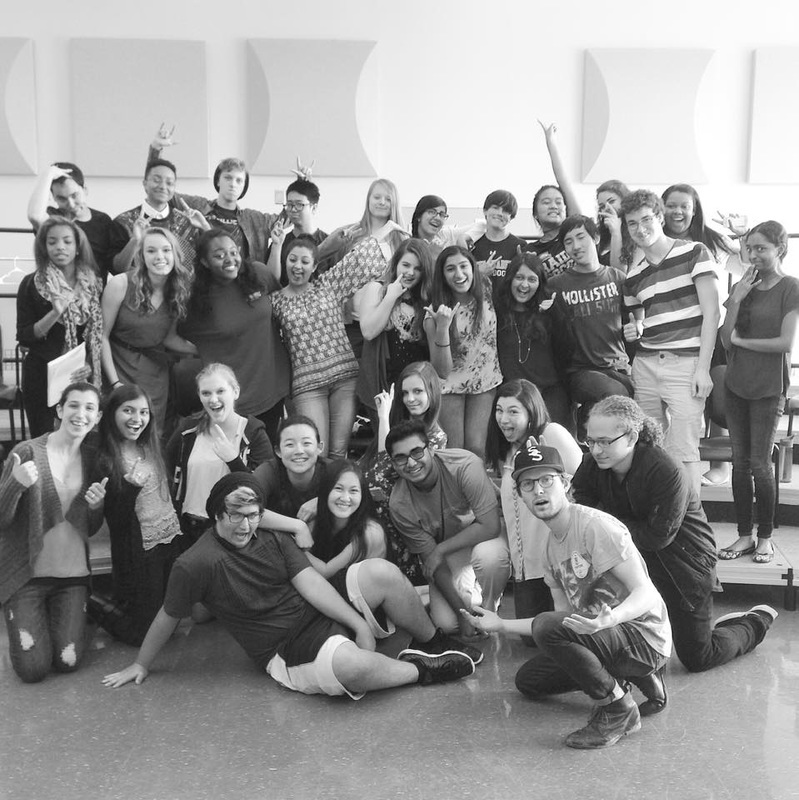 Momentum and Hype are Alpharetta's competitive a cappella ensembles. (a la "Pitch Perfect" and "Pentatonix"). Both groups perform at all chorus concerts, at school and community events, and compete at ICHSA's. 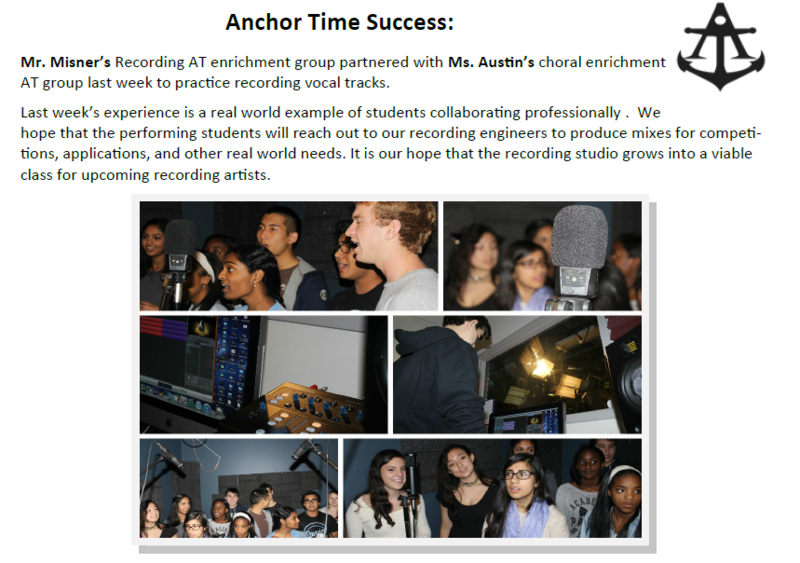 Students who audition are expected to be in our Anchor Time, which is when our main rehearsals are held. Students who have other Anchor Time conflicts will not be considered for an audition. Both ensembles will schedule an additional weekly morning or afternoon rehearsal. This will be determined by the group after each group has been selected. The Alpharetta High School Theatre and Music Departments welcome ALL students to audition for our two musicals this season. *Auditions will be August 17th-18th-19th in the theatre. The audition sign-up sheet will be on the drama room door (black box), room 1101. *Auditions will be November 29th-30th and December 1st in the chorus room/theatre. The audition sign-up sheet will be on the drama room door (black box), room 1101. 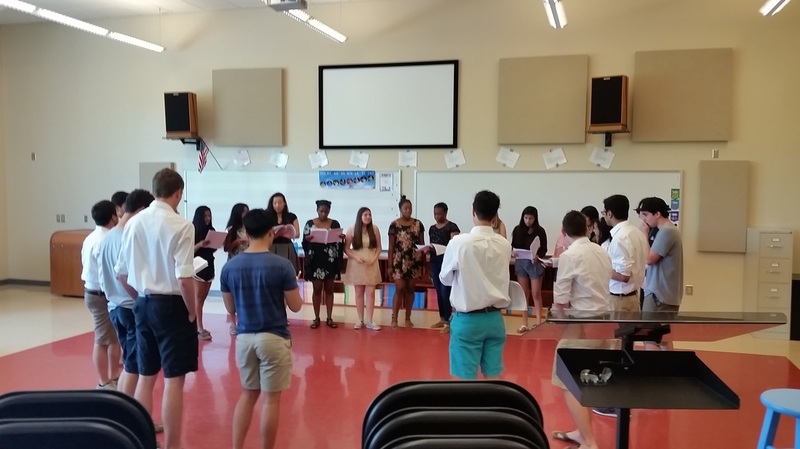 Momentum and Hype Participate in an A Cappella Workshop with Harvard's "Veritones"
In the early part of the summer, Momentum and Hype had the opportunity to participate in an a cappella workshop with Harvard University's "Veritones". The Veritones have competed at ICCA's and are well-known as one of the top collegiate a cappella group. They performed four numbers for us and the students had the opportunity to learn one of their arrangements of "I Need Your Love", arranged by AHS alum William Horton. AHS Chorus Has a SUPERIOR Performance at LGPE! Congratulations to the AHS Chorus program for their SUPERIOR performance at LGPE! 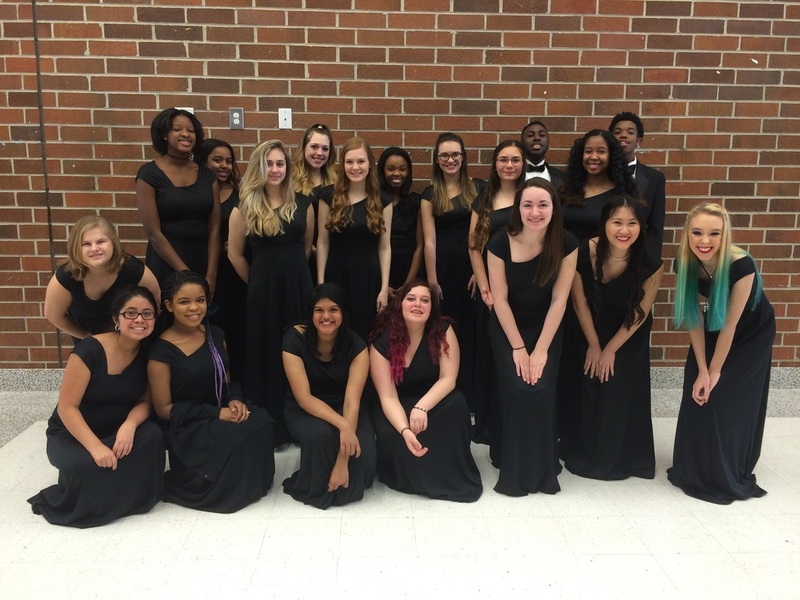 Both the Chorale and Select Women's Ensemble received straight superior ratings in both performance and sight singing. Our Concert Choir also had a fantastic performance. Well done! Clockwise: Chorale on stage, Concert Choir following their performance, and Select Women's Ensemble on stage. 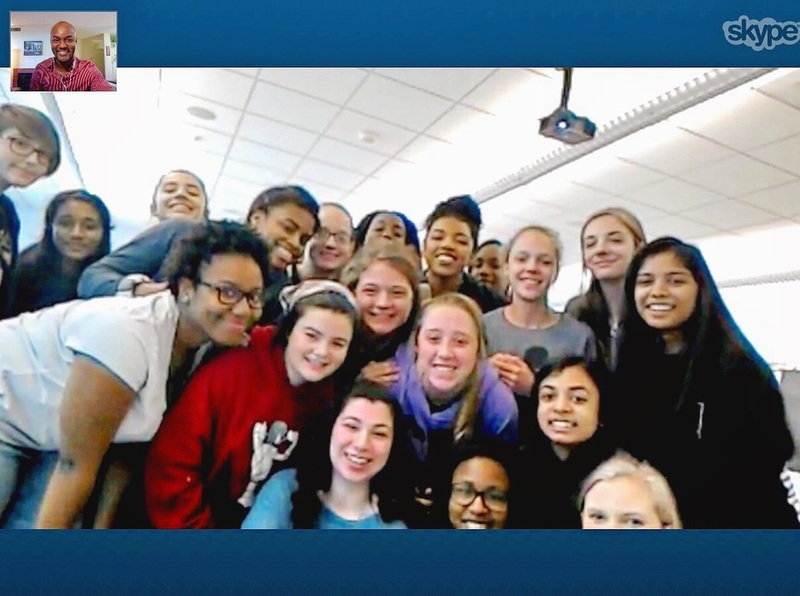 On February 22nd, SWE had the opportunity to do a Skype workshop with Sydney Guillaume, a Hatian composer who currently resides in Los Angeles. SWE is performing his composition "Koudjay" for LGPE next week, and they enjoyed being able to perform for and learn from the composer. Thank you, Maestro Guillaume, for your time and feedback! Congratulations to the following students for being passed on to the second audition for All-State Chorus. Also, a huge congratulations goes to Michael Horton for passing the All-State Reading Chorus audition. He will go on to represent Alpharetta at the event in January. We have been off to a great start in all of our chorus classes this year. Our students have been working very hard to prepare their Fall concert music. Please note that ALL concert dates for this school year are located on my Google site. Click on the choir that your child sings in to see the full list. These dates are also on the calendar that was distributed during the first week of school and at the potluck dinner. CONGRATULATIONS, AHS CHORUS SENIOR CLASS OF 2015! We are extremely proud of all our seniors! Best of luck to all of you as you venture off to college or the work place. Congratulations to the Alpharetta High School Chorus for their stellar performance at the Festival Disney Competition in Orlando, FL on April 9th-12th. The Festival Chorus received a score of 95/100. Way to go, AHS Chorus! + Women: Black performance dress, black closed-toe shoes, hair done nicely and make-up on. +Men: Black tuxedo attire including white tuxedo shirt, black bow tie, black tuxedo jacket and pants, black dress socks with black dress shoes, hair combed and facial hair trimmed. **Remember that this is a formal evaluation and our appearance is also evaluated, not just our singing. If any student arrives that day with the improper attire or if they forgot their attire, a parent will be called to bring it to them before the bus departs, otherwise the student will not be allowed to perform and a grade of 0 will be assigned. - Make sure that all students have filled out the field trip form with parent/guardian and teacher signatures. These were given out a couple weeks ago and were already due, but can be accepted up to Friday (tomorrow). If you do not recall signing a field trip form for your child, please ask them about it tonight. - If you sing with SWE or Concert Choir, I want to remind you that we will be arriving to school past the final bell because of our performance times. If you are usually a bus rider, you should have already arranged your own transportation home for that afternoon. If you have not yet done that, please do that ASAP. We should be back to AHS by 4:30-4:45 PM. For those that have never heard of LGPE, this is the EOC test for the performing arts. We have been preparing these pieces for the last couple of months and will be performing them for 3 judges who will rate us in various categories (diction, tone, blend, and dynamics being just a few) and then will get an overall rating for each group. Immediately after the performance, our students will walk into a sight reading room and will perform a piece they have never seen before. They are given 5 minutes to learn it and will perform the selection for a sight singing judge. It is an incredible experience for the students and gives us all valuable insight on what we are doing well and what we can continue to work on to improve our skills as an ensemble. Please let me know if you have any questions between now and next week. Congratulations to the AHS Literary Team! This was our first year competing at GHSA's Literary Meet, and our chorus students performed well! Chorale - Monday, 02/23. Performance at 12:30 PM. SWE - Tuesday, 02/24. Performance at 2:25 PM. Concert Choir - Tuesday, 02/24. Performance at 3:25 PM. The highlighted choirs are those that have been changed. We had to switch Chorale to Monday and Concert Choir to Tuesday. I have already been notified of a conflict with a government trip and am working through that conflict now. Any student that has an after school practice needs to let me know so I can go ahead and contact their coach. (I'm already aware of soccer practice and am speaking to that coach to excuse those late students.) Please remember that LGPE is a REQUIRED event and is our most important performance of the year. Any conflict that you may have can be worked through, whether by you or by me speaking to a particular teacher/coach. **Please note that because of their late performance time, SWE and Concert Choir will be arriving after the school bell rings on Tuesday the 24th. This will prevent those students from being able to ride the bus home that day. If you are usually a bus rider, please use these next two weeks to make alternative arrangements for pick-up, whether it be with another chorus parent that lives in your neighborhood, a relative, or family friend. We are also looking for a few parents to chaperone on both days. You would ride the charter bus with the students, would listen to the groups perform, and would ride back with us after the performance and sight singing. There is no cost. Please let me know if you are interested in this opportunity. --January payment ($165) is due on January 15th; Final payment ($165) is due on February 10th. -- Students: A calendar will be handed out the week of MLK with Disney morning/afternoon rehearsals. -- LGPE for Concert Choir will be during the school day on February 23rd. Performance time is 12:30 PM. Chorale and Select Women will be during the school day/afternoon on February 24th. Performances times are 2:30 and 3:35 PM. All LGPE performances will be at North Atlanta High School. -- Spring Concert is May 1st @ 7:00 PM in the AHS Auditorium. Students are to wear their black formal attire. This is the first time in AHS history that we have sent a team to Literary. Please wish us luck as we go on to compete at Regionals on February 14th!! Take a look at what Momentum is doing! Our a cappella group was the first to use the newly-installed recording studio equipment that Mr. Misner and the broadcast department put in this year. We recorded two of the songs we've been working on this year and look forward to recording many more tracks. By the end of the year, our group will have a demo CD!! Keep you ears tuned! 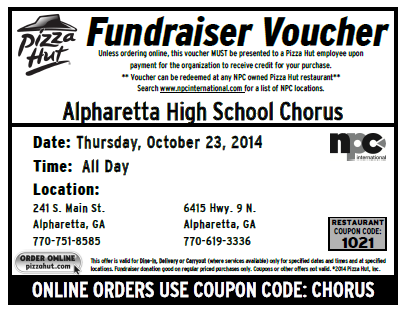 Tomorrow, Thursday October 23rd, the Alpharetta High School Chorus will be participation in a nationwide Pizza Hut fundraiser. Copy and print the voucher below and give to the cashier on-site or to the delivery person when receiving your order. A portion of the proceeds will go directly to our chorus program and will help us off-set the cost of the Disney trip for our students. Please forward this to as many people as possible! Although there are two locations on the voucher, they can be used at any location in the nation! However, they MUST give them the voucher in order for us to receive credit. Everyone has to eat dinner, so why not consider eating Pizza Hut Thursday night? You'll be supporting a great organization! 1. The Fall Concert is on Monday, October 20th starting at 7:00 PM. The concert will be in the AHS Auditorium with a reception immediately following. This concert is curricular and is required by all students to attend. All are invited to attend and the admission is free. 2. The first payment (deposit) for the Festival Disney trip is $200 and must be turned in no later than October 15th. This deposit will secure your spot on the trip. This deposit must be paid by all students and chaperones who plan on attending the trip with us. There are no payment plan options for the deposit - must be paid in full by the deadline. 3. All students who are auditioning for All-State Chorus - Help sessions will be offered on Wednesdays (11/12) and Thursdays (9/10) from 3:40-4:15 PM to assist you with audition preparation. Please plan to bring your solo music with you to each session. The audition is on Saturday, November 15th. These are optional, but will assist you greatly with the audition. 4. If you have not paid your $70 chorus fees yet, please remember to do that. Many people who opted for the payment plan option have only made the first payment and nothing more. You cannot receive your chorus t-shirt without this payment. Cash or checks (AHS Chorus) are accepted. Welcome to the 2014-2015 school year! I am extremely excited about this school year and look forward to making music with all of you. 1) Chorus dues are $70 for the school year. This covers your uniform for the year and allows us to maintain our chorus program. These dues should be returned by August 15th! We also offer a payment plan for those who cannot pay the $70 up-front - you determine how much you can pay per week, and that money will be due on Monday of each week until the dues are paid in full. 2) Camp Glisson is September 5-7th, 2014. This is an optional trip, but is highly recommended! 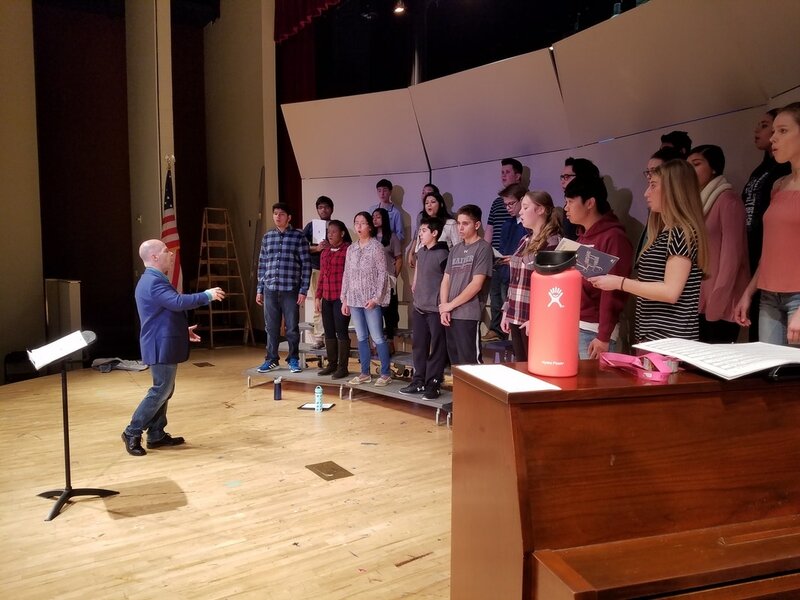 The students not only get the opportunity to bond, but there is also the opportunity for us to sing together and work on vocal technique. The total cost this year is $150, which covers EVERYTHING - transportation, lodging and meals. All students attending Camp Glisson must pay by Thursday, August 21st. 3) We have two opportunities for fundraising at the beginning of the year - Coupon books and the annual Cheesecake Fundraiser. The coupon books will start August 11th and will be used for our Camp Glisson fund; the annual Cheesecake Fundraiser starts August 22nd and will be used towards our general chorus fund/Spring trip fund. CHORAL COUNCIL 2014-2015 VOTING IS NOW OPEN! Please click the link below to place your vote. Voting will be closed at 9:00 PM on Sunday the 18th. Voting is closed and the link has been removed. 1) Students are currently participating in a coupon book fundraiser. The purpose is to help students raise money for their ISA account. There are several dues and payments in August, and this is a great way for students to raise this money before the school year begins. We are also in discussions for a DOMESTIC TRIP next year, so this is an opportunity for them to raise money ahead of time for that. - Spring Concert (April 22nd at 7PM. Call time for students is 6PM). MOVIE MUSIC THEME! - Chorus Banquet (May 2nd at 630 PM in the AHS Cafeteria). Students did an wonderful job at LGPE a couple weeks ago! I am very proud of all our students! Welcome back, students! 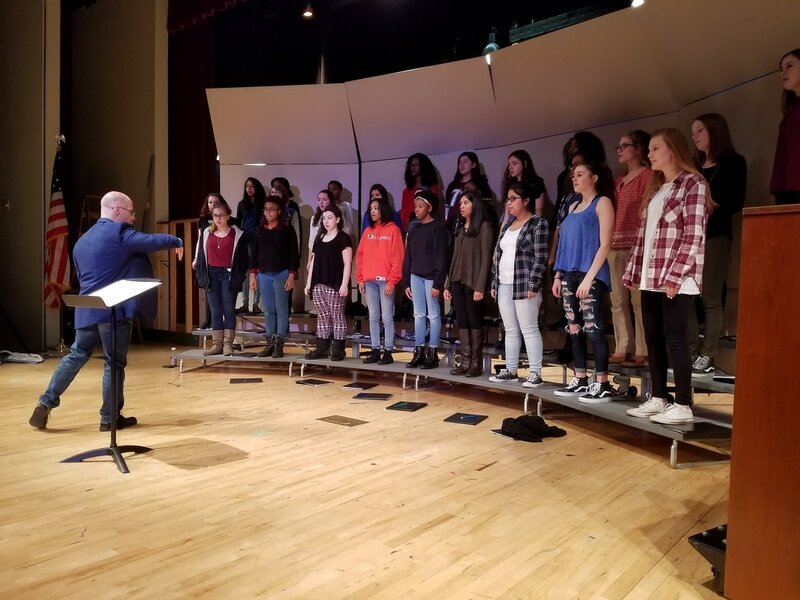 The Spring is a busy time for the AHS Chorus program. 1) Congratulations to our 8 finalists for All-State Chorus. All of our students passed the second audition and will be attending the event in Athens. We are proud of all of you! 2) Large Group Performance Evaluation (LGPE) will be taking place in February. Our LGPE Preview Concert is on February 11th at 7 PM with WBMS Chorus. The actual event will be on February 28th at Sandy Springs UMC. Students will be missing 1st-4th periods that day. **If you are not attending LGPE, you are not required to participate in the LGPE Preview Concert. 3) Keep a look out for our Jan/Feb Chorus Outing - Movie Night! We will host a movie night in the chorus room. Please bring blankets, pillows, and any snacks you might like to have during the movie. Once the movie is selected, we will send out a permission for parents to sign. Students who do not get a permission sign formed will not be able to attend. 4) 8th Grade Transition Night will be on January 23rd from 6-7 PM. If you are an upcoming 9th grader, make sure to go by the chorus table to learn more about the ensembles we offer! THOSE THAT ARE ATTENDING THE EUROPE TRIP - At this point, you should have paid off $1000 of your trip cost. (Deposit plus first payment). There is a Europe Meeting for all parents and students attending the trip on Thursday, September 19th @ 7PM in the orchestra room. We will be going through the day-by-day itinerary, will distribute a final payment plan, and will give you the opportunity to ask questions. AHS CHORALE WILL BE PERFORMING THE NATIONAL ANTHEM AT THE HOMECOMING FOOTBALL GAME! While this is not a grade-dependant event, this is a great opportunity for our chorus to show their talents to the school. Unless on homecoming court or a participant in color guard, students should plan to wear their 2012-2013 chorus t-shirt and jeans. All students who choose to stay for the game will receive free admittance. UPCOMING FUNDRAISERS: We just completed our annual cheesecake fundraiser and are getting ready to kick-off our discount cards fundraisers. Keep in mind that every fundraiser your child participates in allows them the opportunity to put money into their Individual Student Account (monies that can be used to pay off dues, trips, etc.). Please make sure you are fully participating in these fundraisers. MANY STUDENTS STILL OWE US FORMS AND MONIES!!! $65 dues and uniform fee is required by all students. (Students who do not pay will not receive a uniform, and therefore will receive a 0 for all performances). Remember that multiple fundraisers are held during the year to help off-set these chorus fees. There is no reason why monies should not be paid, even for those who cannot pay these dues the first week of school. We give parents and students every available opportunity to raise the funds. Please e-mail Ms. Austin if you have and questions or concerns regarding these payments. The next Europe payment is due by Friday of next week. ($500) Any student who may have difficulties making this payment by the date should speak with Ms. Austin ASAP. Once the final numbers are set between orchestra and chorus, we will be able to distribute an official payment schedule for the remainder of the year. If you did not make the deposit in the Spring (as a student or chaperone) and wish to attend the trip, you will need to turn in the deosit AND payment ($1000) by next Friday. However, I need your name ASAP to give to the tour company. For all chorus payments, please remember that you can earn money for your ISA by participating in the multiple fundraisers we will host. We also have a Fundraising Chair that will be responsible for creating fun and inventive fundraisers for students who wish to put money into their ISA. We will have at least one fundraiser a month! President - Must be a senior. Presides over the entire Choral Council. Serves as the liason between students and Ms. Austin. Manages meetings and makes sure things stay on track and that all officers are performing their duties to the fullest extent. Assists Ms. Austin with the planning of Camp Glisson, chorus concerts, banquet, and graduation. Helps Ms. Austin with any duties that might be needed to enhance the quality of the chorus program. Collaborates with student leaders in other Fine Arts programs to bring unity. Maintains a positive attutide and represents the chorus program well. Social Chair - Plans monthly social events for the chorus. Social VP is primarily in charge of planning Camp Glisson events and games. Finds ways to promote the chorus in the school and community. Plans events to bond the chorus, orchestra, band and drama departments. Fundraising Chair - Comes up with inventive fundraising ideas, allowing us to make money for the chorus and Individual Student Accounts. May collaborate with the Social Chair on events and fundraisers with the chorus and other fine arts organizations. Helps Ms. Austin organize In charge of making sure students are making payments in a timely manner. Promotes fundraiser participation and ensures that all students are making an effort in raising funds. Auditorium Chair - In charge of making sure the auditorium is set-up for chorus concerts and events, as well as events hosted by the AHS Chorus. Comes up with ways to decorate the auditorium for themed concerts. Helps Ms. Austin design the program for each concert and gets students together to fold/hand out programs. Recruits students to assemble/disassemble the stage before and after a concert. Tracks which students helped in the set-up/take down of the auditorium, which directly affects each student's grade. Historian - Needs to be creative. In charge of taking photographs at as many chorus events as possible. Create a monthly newsletter with each month's events, concerts, and news. In charge of the scrapbook station at Camp Glisson. Must complie a scrapbook, online or hard copy, to commemorate the year. In charge of creating the slideshow for the banquet. Chorale/SWE/Concert Librarian - A person will be selected from each class, with one the three being chosen as "Head Librarian". In charge of taking attendance each day are marking tardies. Keeps up with their class's music, including putting music into folders, taking music up, and organizing the main library. Makes sure that the chorus room is tidy and ready for the next class. Serves as the representative for their chorus class. Head librarian will make sure that the library is neat, organized, and that all music is entered into the computer. Our annual Camp Glisson Retreat will be one month EARLIER this year, falling on the weekend of August 23rd-25th. We will be leaving AHS immediately after-school and will stay in Dahlonega until Sunday morning. Lodging, as well as Friday dinner through Sunday breakfast is provided in the cost of the trip. It is set at $150 per student. Payment will be due the first week of school, so save up and plan accordingly. 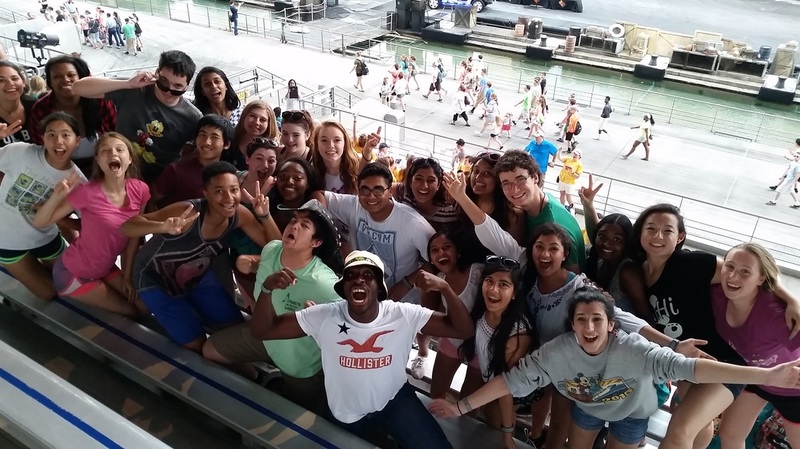 This is a great trip that allows the students to bond and get to know one another. You definitely do not want to miss out! AHS Chorale 2013-2014 - Congratulations! neutral. We want to keep the attention on the graduates and not your outfit. Our Chorus and Orchestra will be taking a combined trip next summer to France, Germany and Austria! First deposit is due NO LATER than May 7th, 2013. The depoist is $500 and will secure your spot on the trip. This year has already gotten off to a great start! - All 11 students who passed the 1st All-State audition passed the 2nd audition. 6 of those 11 students are receiving a seal for receiving a 95% or higher on their audition. (Benjamin Burgett, Amanda Farzad, Nathan Trivers, Aparna Maddala, Jeffrey Lin, Shreya Mishra). - 3 students will be heading to All-State Reading Chorus next week. (Michelle Story, Matthew Prince, Jeffrey Lin). - 1 student will be heading to Dallas, TX in March for National ACDA Honor Chorus - one of 200 students selected out of 2100. (Benjamin Burgett). 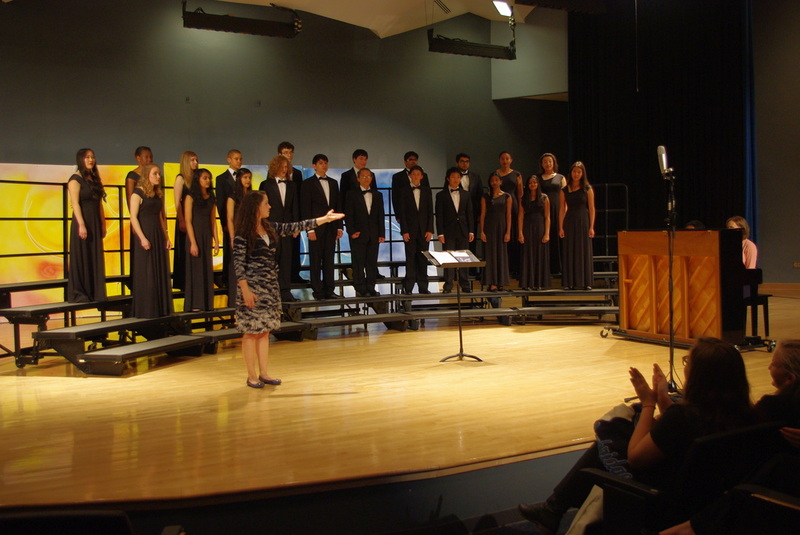 The beginning of Spring is a hectic time for our chorus program. We are preparing for LGPE at the end of February, but our concert is February 5th with WBMS. We have also just cast our Spring musical, HAIRSPRAY! Many of our chorus students are participating in this musical, so I hope that everyone will take the time to see this fun show! Our Spring Concert will be on April 22nd. This is a fabulous concert that allows for our students to truly be showcased. (Many of the students will be conducting, so I will not be involved much at all!) I think it's wonderful that so many students want to step up and take a leadership role. I want to give them every opportunity I can to conduct, sing solos/in small groups, or teach a piece to the class. I also want to congratulate the many seniors who have already received their acceptance letters for college/university. I am very proud of all my students. I look forward to an exciting Spring semester! It is an incredible honor to make it into this ensemble. Only 25 students from each voice part in the state of Georgia make it in. Students were required to sight read five very difficult examples for the audition. The main event will be held in January. This year's audition was extremely difficult, and I could not be more proud of these students! The Fall Concert last night was a huge success! Mrs. Layton and I are extremely proud of each and every student! They made some incredible music last night. Our students performed to a full house of audience members - parents, students, faculty and administrators all came out to support our students. AHS and WBMS are very lucky to have such a supportive community! Monday, October 22nd from 3:45-5:30 PM - Concert Dress Rehersal (Students do not need to wear their uniform). Tuesday, October 23rd at 7:00 PM - Fall Concert (Call time for students is 6:00 PM). Parents - Please make every effort to be at the concert! Due to conflicts with the middle school, the Fall Chorus Concert with Webb Bridge has been changed! 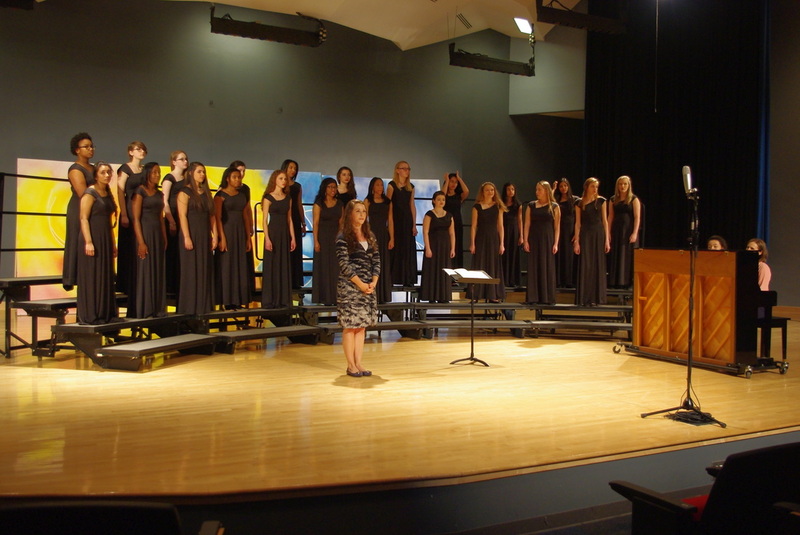 Tuesday, October 23rd at 7 PM - Fall Chorus Concert with Webb Bridge MS. Student call is at 6:00 PM. Please delete the Wednesday dress rehearsal and Thursday concert from your schedules. These students have been recognized based on their talent, effort and leadership in class, and overall attitude. Each month, I will be recognizing three students, one from each class, that exemplifies what an AHS Chorus student should be. These students are recognized based on their talent, effort and leadership in class, and overall attitude. Welcome to the 2012-2013 school year! It has been extremely exciting getting to know all of the chorus students. I know that we are going to have a great year! This will serve as a reminder to the students, as well as keep parents informed of our latest project: In an effort to recruit new students to chorus, I have given my students an incentive to ask their friends to join chorus. This is only applicable for the next two weeks, as the period for a student to change their schedule only lasts from now until August 31st. In order for a current chorus student to get their name in the drawing, they have to recruit a friend who is NOT enrolled in chorus. This recruitee will either join Concert Choir, or can audition for our Advanced Women's or Chorale. Once this recruitee is enrolled, the recruiter will get an entry for the big prize. There is no limit to how many entries you can have; if you recruit 10 friends, then you will get 10 entries! What is this prize, you ask? The students do not know what prize is in the box. The only hint that they have been given is that the product inside of this box is made by APPLE! Yes, as in the maker of Macbooks, iPads, and iPods. Who knows what could be in this box...but if the student wants it, they better recruit! The winner will be drawn at the Chorus Banquet in May. 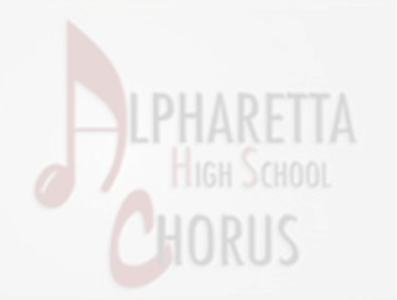 My name is Ms. Michelle Austin, and I have just been hired as the new choral director at Alpharetta High School. I am extremely excited about taking on the program at Alpharetta, and I look forward to meeting the students and parents in August. I have already had the opportunity to meet with several parents and students, and I have been overwhelmed with the support and kindness that I have received. Each of you have truly made me feel welcome. There are a lot of things going on this summer. I have met with several people to help the students and me better transition into the new school year. Earlier this summer, I was able to meet with former director Tom Yackley, where we had the opportunity to discuss the in-and-out's of the program. I have also met with the Choral Association board. We were able to discuss fundraisers, the Camp Glisson retreat, ideas for recruiting new students, and additional singing opportunities for current and future chorus members. There are many exciting things happening on the horizon; the more people I talk to, the more excited I get about the new year! As you can tell, we have a new website. This website will stay continuously updated so that you can receive all of the latest information on our program. Along will current news, we will also post all forms needed by the students, updated video clips and photos, etc. If you have not already, I hope that you will take the time to browse our new website. If you have any questions or concerns, please do not hesitate to contact me. Enjoy the rest of your summer, and I look forward to the 2012-13 school year!